Apple today announced it has sold three million new iPad devices since its launch on Friday, March 16. “The new iPad is a blockbuster with three million sold ― the strongest iPad launch yet,” said Philip Schiller, Apple’s senior vice president of Worldwide Marketing. When looking forward to get my hands on this new beauty, can’t help browsing all the additional cool stuff that goes along with it and I stumbled upon this cover which I would absolutely love! Found on design-milk site (again, one of my favorite, visited daily). 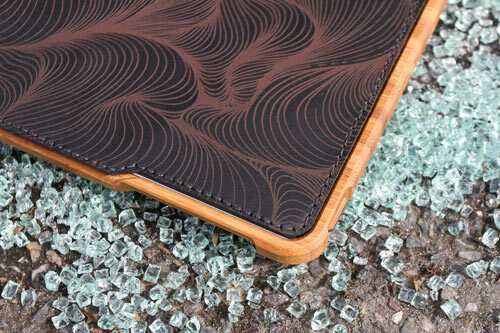 Hand-crafted in Portland workshop, this hard bamboo CNC-milled case has coated with three coats of a natural citrus oil and wax blend and an ultra-suede lining. But the icing on the cake is the felt or leather cover. The leather is all-natural, American-made, vegetable-tanned and the high-end wool is imported from Germany. Held together with magnets, there are some details on the case that make it very, very nice: for example, the wooden power button and the nice speaker vent. You can also get custom images engraved on the bamboo or special illustrations from Grove’s exclusive Artist Series on the cover. You are truly a just right webmaster. The web site loading velocity is amazing. It seems that you are doing any distinctive trick. Also, The contents are masterwork. you have performed a fantastic task in this topic!